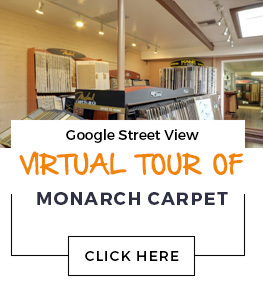 At Monarch Carpet, Drapery & Upholstery we have an extensive selection of high-quality area rugs to suit your every need. Whether you are interested in a luxurious handmade wool rug to serve as the focal point of a formal room or a more durable machine-loomed rug to use in a high-traffic area, we can help. This is the only flooring product you can take with you when you move! Remember, no job is ever too small to merit the dedication and commitment of our staff. Even if you are looking for a very small rug we will be happy to help you find the exact right one for your needs. We can even create a custom rug for you including custom seaming and binding.